About 2 miles south of Steam Corner, Indiana. CR 800 S is the road to Yeddo, IN. Taken May 9, 2004 by John Cirillo. A close-up of the sign above. Taken May 9, 2004 by Sonya Cirillo. 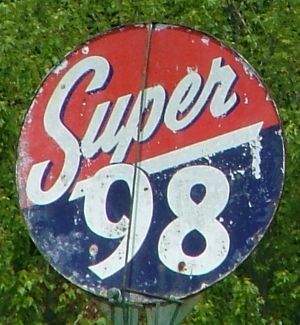 SUPER 98 was the brand of Zehring Oil Co. of Kokomo, Ind. I still know very little of the company history, such as their length of operation or number of stations. Based on what I have seen, their market area appeared to be only central Indiana, probably all north of Indianapolis. I feel fairly sure they are gone now as was through Kokomo on the way to the annual RMCA meet in Hammond in Sept. 2000 and saw nothing of the brand in an hour or more of riding around the city. However, I do have some photos here to send to John and the rest of you. TOP.......Kokomo, Ind. on July 10, 1973. I have no idea where in Kokomo the station was located, but likely it was on US 31. 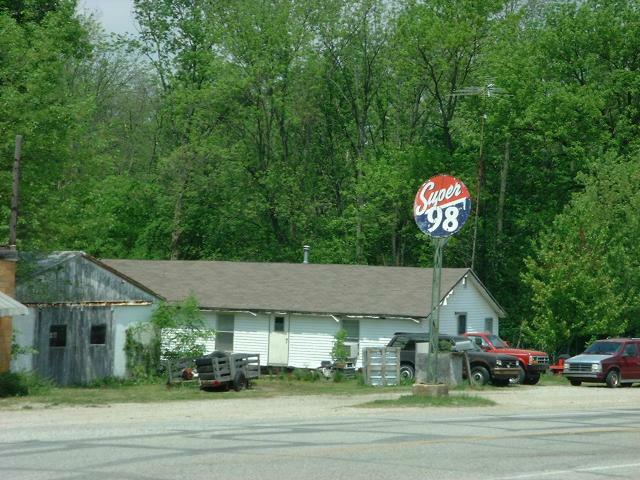 The station appears to be an independent dealer site selling SUPER 98 gasoline with very little branding other than the plastic brand ID sign and a couple of pump decals. A close look shows they offered welding and had AAA service. MIDDLE........ID sign at an abandoned station west of Crawfordsville, Ind. on US 136. August 3, 1992 on our way to "Iowa Gas". I don't think there were any pumps left at the site and I think it was another "dealer type" station, rather than anything that would have been company run. Same sign as in the 1972 Kokomo photo. I was in Crawfordsville this past Sept. on the way to Hammond, and the sign is gone now!! From what I have seen, I believe Zehring Oil Co. was a jobber type operation, distributing to independent dealers, rather than a company that had a chain of company owned sites. BOTTOM.........SUPER 98 pump globe. The photo is from Noel Levy and dates to the late 80s when he was selling a lot of 10-12 globes for someone. I bought a SHAMROCK from the lot but when I think about it, I should have bought this one!! SHAMROCK globes show up at many shows and on a regular basis on eBay, but how many SUPER 98 globes do you see??? Above photos and captions from Walt Wimer, May 12, 2004. 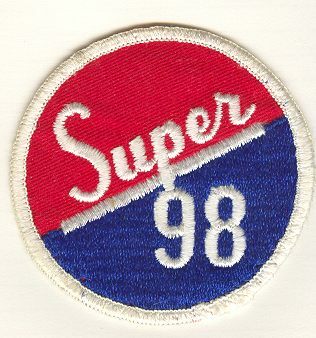 Super 98 uniform patch from Walt's collection.